Capture all of the flavors of the popular Italian dessert, tiramisu, in these crisp biscotti cookies: chocolate, coffee, and sweet Marsala wine. Perfect for dunking in your coffee! Tiramisu is one of my favorite desserts. It has chocolate, and coffee, creamy custard, ladyfinger cookies … what’s not to love? If it’s on the menu while I’m dining out, you can bet I’ll order it. Traditional tiramisu doesn’t contain any alcohol, but many current versions contain sweet marsala, a Sicilian fortified wine. Others use Kahlua, Madeira, port or brandy. I prefer Marsala myself. These biscotti are American-style, which are slightly more tender than traditional Italian biscotti because they contain more fat. I added three of the flavors of tiramisu — chocolate, coffee and Marsala — to the cookies. End result? Delicious! The coffee flavor in the cookies themselves is very subtle. I “fixed” that my dunking them in my coffee. If you want more coffee flavor in the cookies, you can use half Marsala, half coffee; or use coffee-flavored liqueur in your biscotti. Preheat oven to 350 degrees and line two sheet pans with parchment paper. In the bowl of a stand mixer, cream together the butter and sugar. Scrape down the bowl. Add the eggs, one at a time, beating and scraping between each addition. Beat in the vanilla and marsala wine. The mixture will look curdled. In a separate bowl, stir together the flour, cocoa powder, baking soda and salt. Add to the mixture in the stand mixer and mix on low speed just until combined. Stir in the chips. The dough should be very stiff. Divide the dough in half between the two baking sheets. Wet your hands and shape each half of dough into a log, about 9.5 inches long by 2 inches wide by 3/4 of an inch tall (wet hands prevents the dough from sticking to your hands). Bake for about 30 to 35 minutes, rotating pans 180 degrees and switching pans top to bottom halfway through to ensure even baking. Remove the pans from the oven and let cool for 5 to 10 minutes. Lower the oven temperature to 325. Carefully transfer each log to a cutting board (I slid the entire piece of parchment on the cutting board and used a spatula to push the log off the parchment). 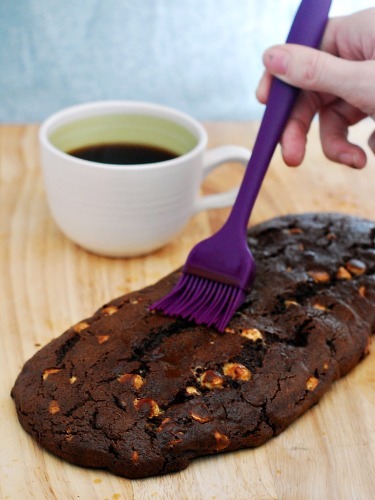 Brush each log with the coffee using a pastry brush. Use a serrated knife to cut each log diagnoally into 3/4-inch strips. Be sure to cut straight up and down. Place the cut biscotti back on the parchment-lined baking sheet, standing up. Bake an additional 30 minutes, until the biscotti are dry. Cool on a wire rack completely, then transfer to an airtight container for storage. Don’t forget to check out the rest of the #SundaySupper Libational recipes! I need to whip up some of these for my oldest…he swoons over any coffee desserts, especially tiramisu! 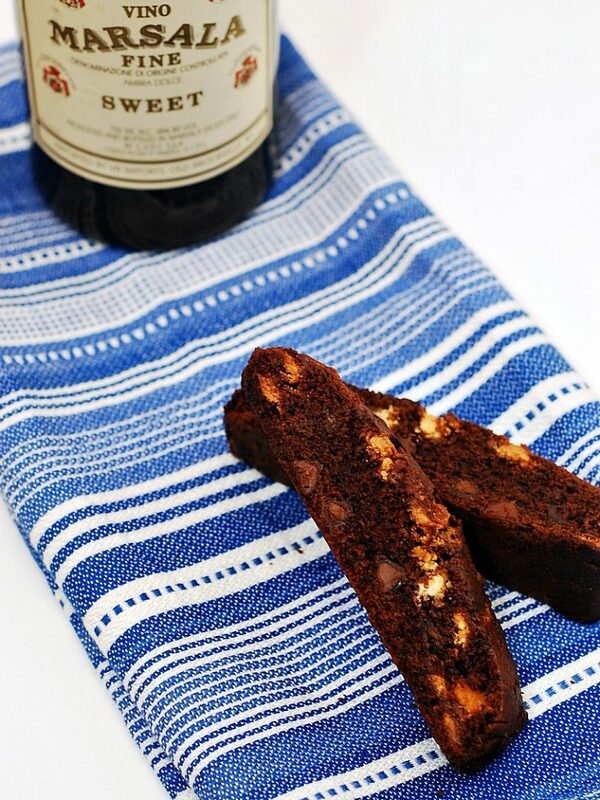 You so captured the essence of tiramisu with this biscotti. Cheers to you! 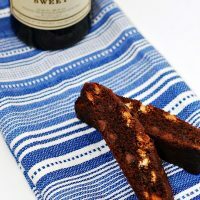 I like to dip my biscotti in marsala ( just like the Italians do!) so this is right up my alley! Oh, I’m so intrigued by the addition of marsala wine! 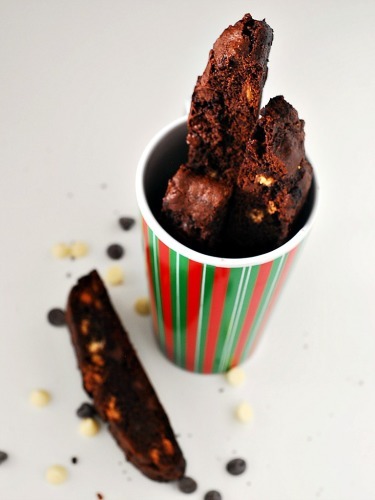 Perfectly delicious biscotti, I love it!! I love biscotti! What a treat! Tiramisu flavor in a biscotti…perfect! WOW, I’m saving this for next year – it will be a hit!